Ever a work in progress, Tinkertown is ready to inspire your imagination and awaken your creative spirit. It took Ross Ward over 40 years to carve, collect, and lovingly construct what is now Tinkertown Museum. 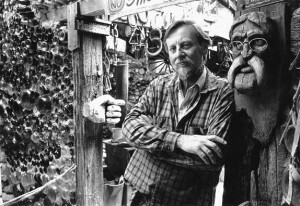 His miniature wood-carved figures were first part of a traveling exhibit, driven to county fairs and carnivals in the 1960s and ’70s. Today over 50,000 glass bottles form rambling walls that surround a 22-room museum. Wagon wheels, old fashioned store fronts, and wacky western memorabilia make Tinkertown’s exterior as much as a museum as the wonders within. Throughout, eccentric collections of Americana (wedding cake couples, antique tools, bullet pencils and much, much more) fill Tinkertown’s winding hallways. Otto the one-man-band and Esmerelda, the Fortune Teller, need only a quarter to play a tune or predict your future. Through a doorway and across a ramp waits a big-sized surprise: a 35′ antique wooden sailboat that braved a 10 year voyage around the world. Ever a work in progress, Tinkertown is ready to inspire your imagination and awaken your creative spirit. We look forward to seeing you soon! Ross Ward was born to paint, carve and tinker. As a boy growing up in the Midwest, he was captivated by the tiny villages, farms and circuses created by “spare time carvers.” His own miniature world began with circus figures carved while in junior high school – now on display at the museum. He began carving the first figures for the turn-of-the-century general store in 1962. Ross carved and built his folk art environment as a hobby for most of his adult life but he was even more prolific in his artistic endeavors of painting, etching, drawing and sculpture. A self taught artist, he was a show painter for carnivals for over 30 years, traveling the country painting on all the major carnival shows and in winter quarters from Texas to Florida. Far more than an impressive collection of miniatures and memorabilia of all kinds, Tinkertown is a living testimonial to Ross Ward’s belief in self determination and independence. It is evidence of his singular pursuit of creating a true folk art environment in the style of Grandma Prisby’s Bottle Village in California and Reverend Howard Finster’s Paradise Garden in Georgia. It has grown from a one-room museum welcoming 943 visitors in 1983 to a roadside attraction hosting over 20,000 visitors in 2004. In February of 1998, at age 57, Ross was diagnosed with Alzheimer’s Disease and passed away November 13, 2002. The Ward family continues his legacy by maintaining and running Tinkertown in his memory. This season is Tinkertown’s 36th and something is always happening at the museum. In the spirit of Ross’ adage: “The show must go on!”. If you would like to purchase a book about Ross Ward’s life and how Tinkertown came to be, please call or email with your request.